Brewery Entrance off Colfax Ave.
Fiction Beer Company is the product of owners Ryan and Christa Kilpatrick’s love for both good beer and a good story. These self-proclaimed “book dorks” saw the need for a brewery in the area of Park Hill, Montclair, and Mayfair. In September of 2014 they opened the doors to Fiction Beer Company and the rest is history. for those looking for good conversation. There is a large patio that regularly features a nearby food truck to feed those hungry bellies. 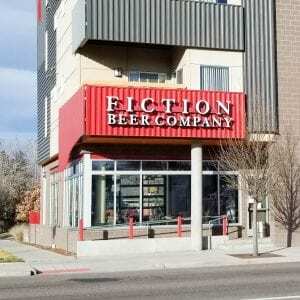 Fiction Beer Company of course offers up a book library to borrow a new title and leave another. There’s also an assortment of games for use during your visit too. Don’t forget to take a gander at the books that make up the bar you’re sitting at! 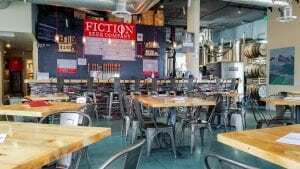 In addition to having a wonderfully unique and cozy space, Fiction Beer Company also offers up a variety of wonderful events in their taproom. Naturally one of those events is a monthly book club. 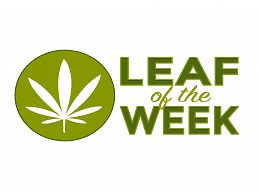 Other events include various beer releases, anniversary parties, trivia nights, and more! Give them a follow on Facebook to keep up with all their happenings. Do Not Touch the Flamingos – a apricot saison. Drink Me, Alice – a sour blonde ale with passionfruit, orange, and guava. Feely Effects – a sweet coffee milk stout. Madame Psychosis – a New England style IPA and bronze medal winner at Great American Beer Festival 2018! Magic Wallet – a passionfruit milkshake IPA. 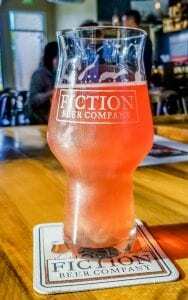 Shark Jumper – a prickly pear and pomegranate blonde ale with glitter. Veritaserum – a Belgian sour with pumpkin and cranberry. 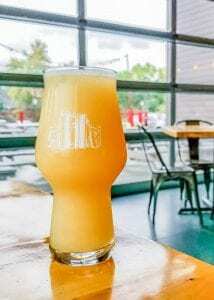 We Can’t-elope – a cantaloupe gose. With so many phenomenal offerings how can you possibly go wrong?! 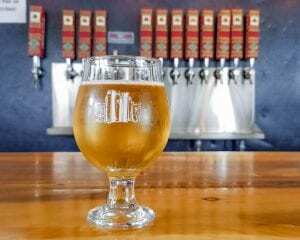 It’s no tall tale that Fiction Beer Company brings a breath of fresh air and a wonderful glass of beer to the Denver brewery scene. Don’t believe me? Go ahead and check it out for yourself. You’re bound to be smitten.